"Yes trunks, my brother Minosha is just like you..."
I've forgotten where this info came from. Sorry! Edited by yours truly (contact me). The image came from Tapion's Oracle. 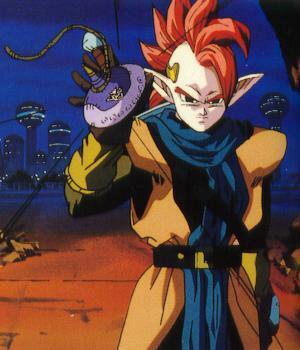 Tapion plays a large role in Dragon Ball Z movie number 13: "Dragon Fist Assault: If Goku can't do it, who can?" He carries a holy sword and flute, which he was given to defend his planet against Hildegarn. The flute is used to stop Hildegarn in his tracks, while the sword is able to do some significant damage. Tapion was sealed in a box along with one half of Hildegarn, after Hildegarn was cut in half by a warrior. His younger brother was sealed in a seperate box with the Hildegarn's other half. Later he shows amazing power. He became stronger than Videl, Gohan, Gotenks all put together! It's a lucky thing he's on the side of good. Tapion gives his Holy Sword to Trunks as a gift. The above description came from Kamikaze God, and was edited by yours truly (contact me).